The Italian progressive rock scene is huge. Many Italian bands have reached music lovers overseas from their country. I myself am a lover of the Italian progressive rock. In some way their music has something nostalgiac and it often refers to 70s symphonic rock. Until today I had never heard of Cantina Sociale, I must confess. The line-up of the band is: Elio Sesia (guitar), Rosalba Gentile (piano, keyboards), Marina Gentile (guitar), Filippo Piccinetti (bass), Massimiliano Monteleone (drums). I noticed directly that the band has no vocalist. So the conclusion is, Cantina Sociale is an instrumental rock band. Coasfere is the third album of the band. The former two albums got rather mixed reviews. So I didn't know what to expect. As I mentioned elsewhere, instrumental albums are not my preference. In my humble opinion these albums soon bore me. So how about this? The album opens with a track called Graffiti. Graffiti reminds me in general of diverse colours and of rough drawings. The track starts with classic guitar in an atmosphere of darkness and emptiness. Soon after that, a heavy guitar, with a really nice grunge sound, breaks through this silent part. The guitar riffs are interesting and very colourful. The keyboard parts are completely in balance with this song. The song reminds me of Camel, by the way. The production and overall sound of this number is really great. Temporali Nascosti, starts in the same way as the first track. So classic guitar in dark atmospheres. The middle part reminds me of Pink Floyd in the early days. The character of the whole song is more or less psychedelic. Scrupolosamente Arioso is a song that opens more mainstream and less psychedelic. The guitar sound has some chorus in it and sounds nice and transparent. The piano puts a melodic layer over this song. Personally this song is one of my favourites. After a low-tempo track, Pietre is a mid- to up-tempo song. The song has also a slightly psychedelic character. An overdriven guitar leads the song. The title track Caosfera starts modest, as most of the songs. It's varied with a lot of changes in atmosphere. This keeps the song in some sort of tension. The last track Verso Sera is a nice song to end the album with. Piano and classic guitar make a beautiful intermezzo-like song. It sounds heavenly. 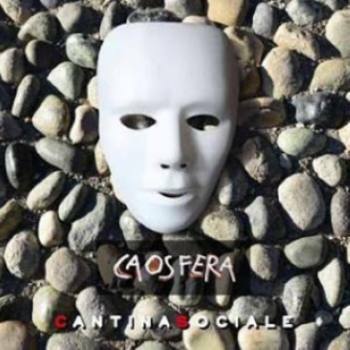 Cantina Sociale has delivered a nice album. The songs are balanced, the recording is great, the artwork is sublime and the band is playing very well. If you like the named references, please listen to this album. It could be your taste.